Its been a week since I last posted. How time flies. Haven't been able to complete any wire wrap project but intend to later today. Not that I don't want to but was busy with work (traveling on weekend..again! ), spring cleaning (since its close to Chinese New Year) and a bit of shopping here and there. 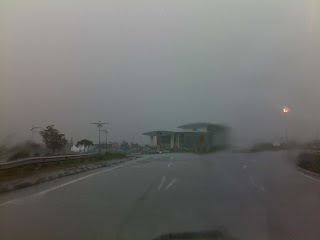 I was in Bintulu (yeah!...again) yesterday and it was a wet wet trip. Flooding here and there and we have to cancel one of the meeting with the villagers. Another trip another day, most likely after Chinese New Year. Here are some pictures of the wet! wet! 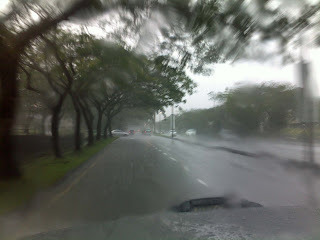 condition in Bintulu and Kuching this morning. It has been raining non-stop for the last 3 days. This is not a river, its a flooded road in Bintulu. The roadside stall where we had our lunch. Almost flooded as well. Wet! wet! flight to Bintulu yesterday. Wet! wet! heavy clouds over Bintulu as we were landing. Kuching this morning, look at the sky! 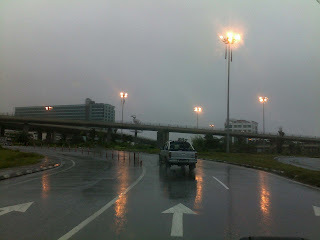 Kuching this morning at about 10 am but looked like 6 am. Oh wow Mei! Stay safe and dry! Hi guys! the rain is finally gone for now but not before it got many places & the city center flooded as well as people evacuated to higher ground.